Just another ordinary week on Stardoll. Gonna recap the highlights of it, but don't expect too much interesting stuff. (Ok, maybe one.) Not too much actual stuff that happened at all. Here we go. The week started with a release of new items to Splendid jewelery store. It is true that some of the items are truly gorgeous. It is also true that not all of users are big fans of jewelry that goes to our beauty parlor. Having to go back and forth between beauty parlor and suite, so you can arrange jewelry well and coordinate it well with clothes. Those eyelashes are a nice thing though. You can't get that long eyelashes using just an ordinary mascara. Also the sparkles that go out bellow our eyes. One note though - on Stardoll advert for the collection, one of the dolls had her eyes closed. Which we do not have as a facial feature. It would be kinda nice change if they added closed eyes, agree? 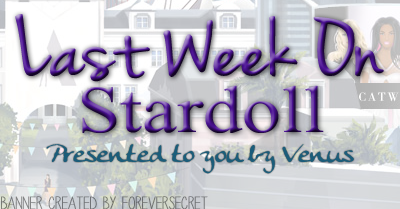 On Wednesday, I don't really have to say is, as I am sure you all know what happens every 2nd Wednesday on Stardoll. For ones who don't, it is a new Callie's Picks collection. This collection brought back a lot of rares. For example, there are some Mortal Kiss items, which are quite valued by collectors. Also, the controversial Migliukee collection, that got removed due to copy right issues, is now back - well some items at least. Some HotBuys, some items that were quite cheap or even free. Anyway, nice items, not so nice prices, some superstar only items, etc, etc.. Of course, there are always people complaining that their valuable rares got re-released, stuff from their collection, stuff they paid so much money for. Me? I don't usually pay much for non-limited stuff, and do not collect much stuff, so in most cases I have nothing to worry about. The store is called "Bird's eye view", and the reason behind this name is that the stuff looks kinda 'weird' at first look. But that's the way it was supposed to be. Instead of ordinary suites, this collection gives us the impression that we are seeing the scene from a 'bird's eye view', or a view above the ground. Quite interesting idea. I definitely can expect more stuff like that. Sunburns look kinda weird though. I mean, how many dolls want to make their dolls look sun burnt, especially with the white tan lines where a phone or a hand is supposed to be? That sums up everything. Well, not exactly everything. There is a Subcouture interior, which I guess they forgot to include when the collection arrived. New design pattern, and something that wasn't mentioned here - a new Stardoll contest whee you can win some real life stuff. You can read about it more on Stardoll Contests page. Thee is also a spoiler for new store coming tomorrow, fingers crossed that it won't be limited or too ordinary. Or overpriced. Whatever. See you next week.